Uruguayan-born architect Rafael Viñoly is best known for designing 432 Park, the tallest residential building in the Western Hemisphere, but apparently, he makes time for private homes, too–at least when they come with headline-making features like a bullet-proof glass facade. 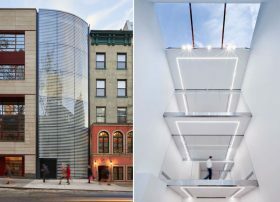 His firm was first tapped to design the townhouse at 162 East 64th Street back in 2015 by Argentinian business mogul and billionaire Eduardo Eurnekian. Originally, the seven-story (don’t worry, there’s an elevator) residence was to serve as both his home and U.S. headquarters, but it looks like he instead decided to list the finished product for $50 million (h/t CityRealty).